Most of my knitting projects don't really have stories, but this pair of socks has as much of a story as you'll ever get from me, I suppose. I cast on the Rosebud Socks pattern by Wendy D. Johnson in Canada during a trip to visit a friend. Upon my return to Finland I had an obligatory five-day break from the project, first due to two days of traveling (which was really only supposed to be one day, but I got stuck in Amsterdam for an extra day due to the chaos caused by the snow), and then for an extra three days since my luggage, including this knitting project and a bunch of yarn I purchased on the trip, was delayed. When I finally received my suitcase I was just very grateful it didn't get permanently lost, considering there must have been thousands of other bags stuck at the airport, as well. This was my first time knitting with Wollmeise, and while the colors are very nice, I don't really get what makes this yarn so special. It's quite splitty for a sock yarn. I've been interested in trying for some time, due to its popularity, but since it's so difficult to acquire from the online store, which is out of stock most of the time, I figured my only reasonable way of getting it would be another knitter who wants to get rid of hers. I found an American knitter who was selling two skeins of Sockenwolle 80/20 Twin on Ravelry in a color I liked, and had her ship them to my friend's place in Canada, where I would be visiting soon. It worked out fine, but I don't think this yarn is quite worth the effort! It may be hard to believe, but this was my first time knitting the Monkey pattern. I have to admit I have no idea why it's so hugely popular, apart from the fact that it's free. It was certainly an easily memorized pattern, but I don't see anything that sets it apart from many other sock patterns. Any way, I thought the Fleece Artist Nyoni I had sitting in my closet would be a suitable yarn for this project. It's at the upper end of degree of variegation I can tolerate in a yarn, and Monkey seemed like a pattern where I could take advantage of that. I think the pattern-yarn combination works pretty well, but I'm not ecstatic about the end result. Maybe blocking would improve it. I don't normally block socks because they "block" just fine in regular use, but this pair might benefit from it. I've been so happy with my Rose Red that I decided I want it in another color, as well. I used the same yarn, Rowan Kid Classic, since the yarn and pattern combination worked so well the last time, as well, and the same needles, 3.5 mm. 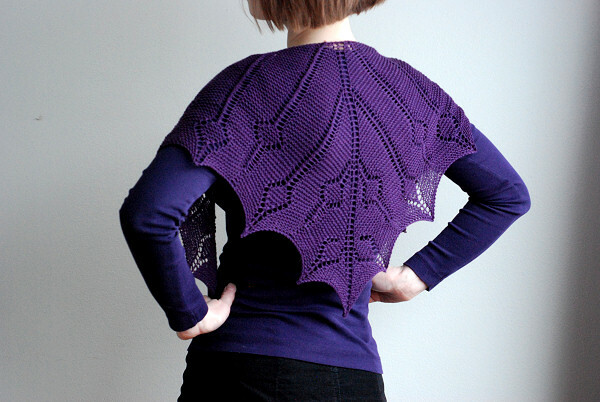 The pattern is a genius one by Ysolda. 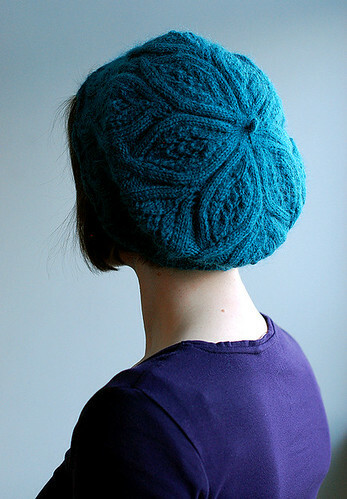 Definitely my favorite hat pattern of all the ones I've knit so far, and there have been a few. I bought the yarn just before hopping on a train on Saturday, cast on on the train, and on Sunday, on my train ride back home, I finished it. (There was some off the train knitting in between, as well.) I blocked it slightly smaller than the red one, since I'm wearing it differently than I originally did, and it doesn't need to be as roomy. The camera, once again, fails to capture the correct shade of teal. It's slightly more greenish in reality. Last weekend I realised I could really use some tasteful legwarmers with my new winter boots. I grabbed some black Garnstudio DROPS Alpaca I've had sitting in the closet for the past three years, 3.0 mm DPNs, and estimated the stitch count based on knee socks I've knit. I figured the gauge wasn't that critical, because the ribbing would make them quite stretchy, in any case. 84 stitches turned out to be pretty perfect. I'm quite happy with the result, they turned out just the way I expected. These will get a lot of wear with my skirts, and I might make more of these in different colors. It's been a while! Getting back to knitting, I wanted to start with something less demanding so as not to get discouraged too easily. 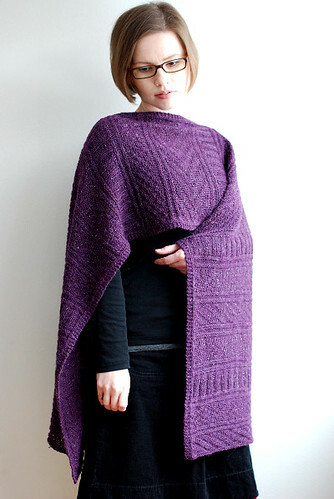 The Guernsey Wrap by Jared Flood seemed like the perfect project for that purpose. I chose Rowan Felted Tweed for the yarn for an airy and tweedy look, and it seems to have worked out pretty well. I'm not sure what kind of practical use I will have for the finished product, but at least it looks nice in pictures. In the past few weeks I've been knitting this shawl in a leisurely manner. I had the goal of finishing it before Saturday this week, so that I could wear it to my brother's high school graduation, likely the only somewhat formal occasion I will be attending this summer. That goal was reached quite easily. For the most part, the pattern, from Nancy Bush's Knitted Lace of Estonia, was easily memorized or at least followed. The nupps were the most challenging part for me (purl seven together, yikes), followed by the Kitchener stitching required to attach the top lace edge to the rest of the shawl. The mid portion, so, most of the shawl, was very easy. I used a lace weight yarn called Elegant by teetee (which, I've found out, is the exact same yarn as Wetterhoff Silvia, which I also have in my stash in a different color). It's a "natural" shade of white, and I think I would have preferred pure white instead, but I think this will do. Pure white would have looked better against the black dress, though. I'm interested in knitting other shawls from this book, too, at least ones with no more than a moderate number of nupps. However, I've signed up for the 52 Pair Plunge at Ravelry, meaning you will be seeing a lot of socks from me in the future, again. More Cat Bordhi socks, but this time from her new book, Personal Footprints. It's a totally new way of knitting a sock, which intrigued me, because I'm tired of the traditional sock construction. First you knit the toe, foot and heel as a closed tube, and then you cut it open at the top to knit the leg. I didn't actually make the cardboard footprint you're supposed to with this book, I just took measurements at certain points and it worked out fine. I like both the toe and the heel (which you can't see very well in these pictures, but especially the heel looks very different from your average sock's). I'm not quite as enthusiastic about my choice of yarn. It was my first time working with Spud & Chloë Fine, which I was interested in because it contains silk, but it feels a bit like plastic to me. It was OK to knit with, but I don't think I'll buy it again, because I have so many other yarns like better. The needles were 2.5 mm circulars magic-looped once again. More socks! More socks based on New Pathways for Socks Knitters! This time knit with the Upstream method where the gusset increases form a V on the top of the foot. A pleasant knit. I've started to really enjoy knitting this heel; It's what I look forward to now. I know the heel by heart now, and I'm able to skip some marker placement manoeuvers to make it a bit more straight-forward. The yarn was Lorna's Laces Shepherd Sock Solid (for the third time recently), and the needles 2.5 mm circulars magic looped, again. More knee socks! Since I found a good template with the last pair, but wanted to improve some things (mainly the length), I wanted to give it another go immediately. The foot and heel are, again, based on the Riverbed Master Pattern from New Pathways for Sock Knitters by Cat Bordhi. 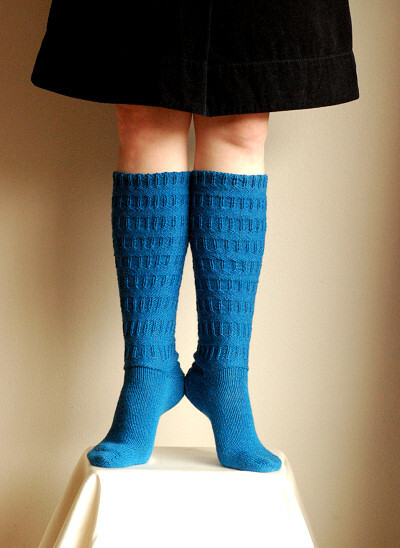 The calf increases and the cable in the back are based on Laura Chau's Delicious Knee Socks pattern. The turned cuff with an adjustable elastic band is my own improvisation. This time, I've very happy with the length of the leg. The only complaint I have is that I seem to have knit one sock with a slightly looser tension than the other, and so the foot/heel on one sock is slightly loose. It was my first time knitting (well, completing a project) with Opal, and, at least in a project with this much plain stockinette, it shows every little irregularity very clearly. Wet blocking will hopefully take care of that. I used a bit of Lorna's Laces Solid Sock on the inside edge of the cuff, because I was close to running out of the main yarn. I used 2.5 mm needles for most of the sock, and 2.25 mm ones for the inside edge. After several failed attempts at more complicated sock patterns, I fell back to a simple stockinette sock in a previously familiar pattern, the Riverbed Master Pattern from Cat Bordhi's New Pathways for Sock Knitters. Knitting them up to knee length was an idea that I only got when I was already knitting the leg, and started to wonder if I had enough yarn to make them longer. I did, and I still even had some yarn left over. I increased stitches for the calf, and then turned the cuff so there is space for an elastic band inside it. It looks like these are going to be my first knee-length socks that actually stay up. I may have to make more socks like these, but I think next time I will make them with a slightly longer leg. The yarn is Lorna's Laces Shepherd Sock Solid, which I love for its softness. I used 2.5 mm needles for most of the sock, and 2.25 mm ones for the inside edge of the cuff. Looks like this pair of socks was my only finished project for March! It's the Sock Knitters Anonymous Mystery Sock for March 2010 by Kristi Geraci. I left out the second pattern repeat from the leg when I realized that with two repeats the cuff went so high on the calf it started to get way too tight. With this modification the sock fits a lot better. I used 2.5 mm needles and Colinette Jitterbug. And, man, does this yarn bleed! Every time after knitting this sock for a few minutes my fingers had turned yellow. I've had bleeding problems with Jitterbug before, which I why I refused to knit with it for a while, but I was tempted by this colorway. These socks will be handwashed, in cold water, for sure. Killing three birds with one stone, I knit these socks to qualify for three different knit-alongs: The Sock Knitters Anonymous (designer of the month being Yarnissima), Solid Socks (the colors of the month being pink and fuchsia) and Ravelympics (any kind of socks knit during the Olympics). I finished them today, just in time to post pictures before the end of the month and the Olympics. 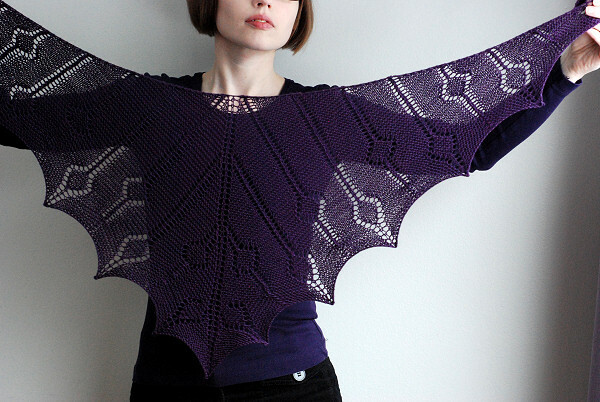 The pattern, The Portland Gussets, is a fairly recent one from Yarnissima, and probably one of her easiest ones. I like the clean lines, and the way the gusset increases are done. This was my first time knitting with Lorna's Laces Shepherd Sock Solid (that became available for the first time at the LYS very recently). I have yet to see how it wears over time, but what I can say now that it's very soft, the colors are beautiful, and the yarn is slightly splitty. The leg of the socks turned out quite tight, for some reason, even though the stitch count and gauge are similar to many other socks I've knit. I noticed the same thing with KawKawEsque, and I wonder why it is. If I knit this pattern again, I'm going to use a larger needle for the leg only, because the foot part is not tight at all. Yarnissima being the designer of the month at the Sockdown on Ravelry, I decided to give this pattern another try. I first started knitting a pair a few months ago but didn't get much further than the toe, and gave up. It was still not my favorite sock pattern to knit, with the purling through back loop and such, but otherwise it was a relatively easy pattern, and I really liked the look of the socks, so I decided I had to finish them this time. For the yarn I used Araucania Ranco Solid and for the needles I used 2.25 mm circulars magic looped. They are a very snug fit. I think these socks will get a lot of use. 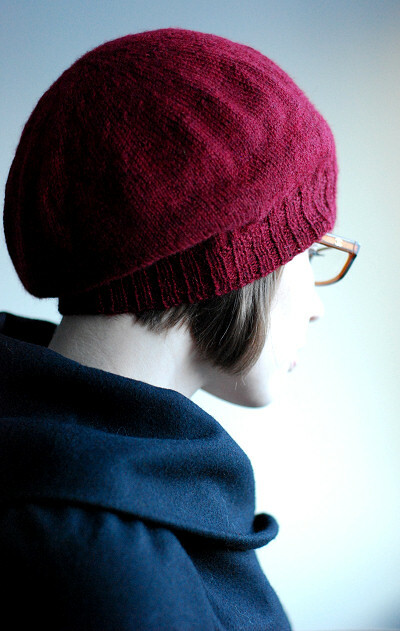 My second contribution to the Ravelympics, this simple hat pattern by Laura Chau, was perfectly suitable to be knit while watching TV. I was also glad to be able to use some year-old stash on this in an effort to slim down my ever-growing collection of yarn. I knit the size M eventually, because the size L I started at first was a bit too loose regardless of the fact that I have a big head (57 cm/ 22½ inches of head circumference feels slightly freaky for a short woman like me). I also used smaller than recommended needles for the ribbing, and that was the right choice. I might want to reknit this pattern with some drapier yarn, like alpaca, though, and something with less stitch definition, because I don't like the way the k2togs stand out with this yarn. 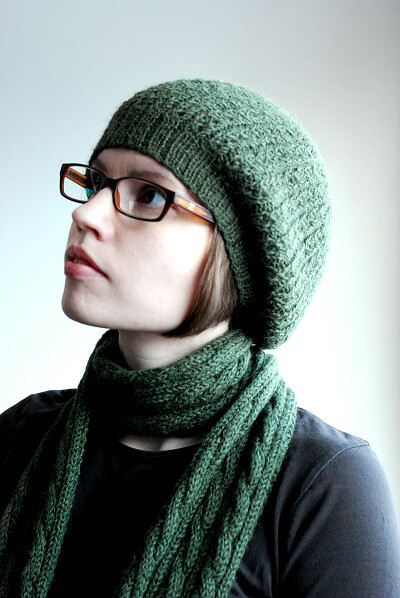 Inspired by the on-going Ravelympics and my simple need for a green hat, I set to knit my fifth Porom (by Jared Flood). I've been wearing #3 a lot this winter, and I wanted another one in a different color to match some of my other clothing. I used the same yarn as in the two previous ones, Sandnes Garn Alpakka, and the needle sizes I had previously found suitable, 3mm and 4mm, and got exactly what I wanted. Sometimes it's nice to knit something that's pretty much guaranteed to be exactly what you had in mind, so I don't mind repeating the same pattern every once in a while. At some point in late January I started to feel like I'd hit a wall with sock projects, so I decided to try something different: a quick yet seemingly sizeable shawl that uses about the same amount of yarn as a pair of socks but appears larger due to the lace knitting gauge and blocking (and therefore makes me feel like I achieved something remarkable without putting too much time or effort into it). 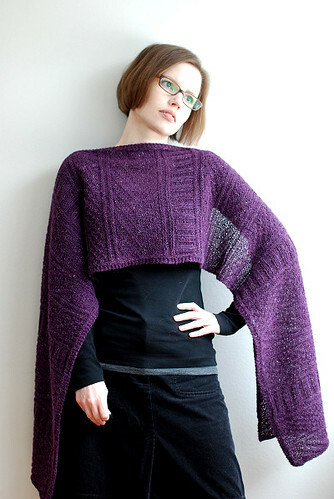 The plan worked perfectly, and the recent Milkweed Shawl pattern by Laura Chau was put to good use. I used some sock yarn, Grignasco Bambi, that I never managed to turn into a pair of socks even though I tried several times (I'm not a big fan of merino for socks, but it does feel good against your neck as a shawl.). For the needles I used 3.5 mm as suggested by the pattern. I'm pretty happy with the result! I plan on using this as a scarf, just like all the other small shawls I've knit in the past year. Inspired by a Cookie A. KAL on Ravelry, I decided to knit this pair of socks for my BFF to replace the failure that was the pair in the previous post. How convinient: BFF for the BFF! Pastel colors aren't usually my thing, but I got an urge to knit something with lavender colored yarn, and I think the pattern and yarn make a good couple here. It was a pleasant knit, with Kirjo-Pirkka (again) and 2.25 mm DPNs. The socks are also nice and stretchy and therefore forgiving with gauge irregularities. I think my gauge was a bit tighter than in the pattern, and having expected that, I chose size medium instead of small, and it turned out fine. Fail! I've delayed blogging about my second pair of socks for this year, because they were such a failure. They're based on the pattern Child's Sock in Miranda Pattern from Knitting Vintage Socks, with the modification of switching the toe to a round one. The yarn is Kirjo-Pirkka and the needles 2.0 mm. These were originally meant to be a gift to a friend, but I don't feel giving someone something I consider a failure. Why a failure? While the foot is almost too tight, the leg is way too loose, and has a weird bulge at the back of the ankle caused by calf decreases that, in my opinion, are placed way too low. I'm apparently not the only one with this problem. If I were to knit these again, I'd either start with fewer stitches, or make the leg longer by adding pattern repeats after the decreases, so the shape of the leg actually fits an average adult female's leg. The knitting year is off to a good start! Inspired by the January KAL in the Sock Knitters Anonymous group on Ravelry, I decided to knit the Conwy pattern from Knitting on the Road by Nancy Bush. 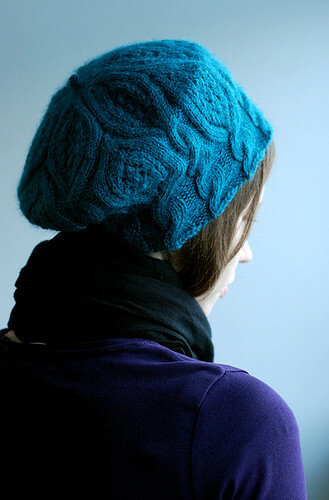 The yarn is a local ecological yarn called PukkIlu from Handu, in colorway Totinen tyrni. I have placed an order for four more skeins of this yarn in different colors now! There was a store update today, but it looks like it's almost sold out already. I'm not surprised! The needles were 2.5 mm HiyaHiya steel DPNs. The size turned out perfect.